Look for wild blueberry blossoms in the woods at this time of year. They’ll produce tiny wild blueberries in July and August. Aside from maple syrup, nothing says New England like blueberries – and the blueberry pancakes we serve with maple syrup. 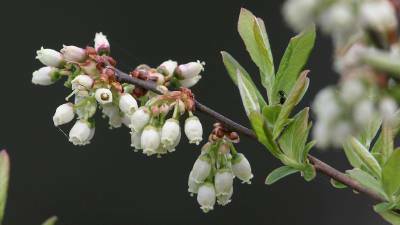 Many Westborough residents like to grab a snack of tiny, tasty wild native blueberries from bushes in the woods in July and August, but how many of us notice the wild blueberry blossoms of late April and early May? Like the berries they produce, the blossoms are small and numerous. Often described as bell-like or urn-shaped, they appear in drooping clusters before the leaves come out on the shrubs. They’re white or slightly pink. Look for blossoms (and later the blueberries) on the low-bush blueberry shrubs (Vaccinium angustifolium) that typically grow in woods with oaks and pines. You’ll find them in places such as the Bowman Conservation Area or Headwaters Conservation Area. These low plants are usually from 3 inches to 2 feet high. You can also find blossoms on highbush blueberry plants (Vaccinium corymbosum), which grow 3-10 feet tall along the edges of our ponds, such as Sandra Pond, Mill Pond, or Lake Chauncy. In the summer, people often enjoy picking the berries right from their canoes. The blueberry blossoms attract bees with nectar and pollen, but it takes a special technique called “buzz pollination” to get the protein-rich pollen from the blossoms. Honeybees don’t do buzz pollination, but bumblebees specialize in it. They collect pollen to use as the main food for their developing young. Why do blueberry flowers need buzz pollination? Their pollen doesn’t just brush off on visiting bees. Instead, it is tucked firmly inside a male flower part, or anther, that’s shaped kind of like a salt shaker, with holes at one end. When the bumblebees buzz the flowers, pollen shakes loose and sprinkles down on them. They later groom themselves and move the pollen to “pollen baskets” on their legs and carry it back to their nest. Other common plants that need buzz pollination include cranberry, tomato, potato, pepper, eggplant, and kiwi. Some bumblebees skip the work of buzz pollination and just go for the nectar deep inside the blueberry blossoms. They do this by chewing a hole in the base of the flower, where the nectar glands are. Once the hole is there, other bumblebees as well as other bees and insects use it to get nectar. If you’re out among the blueberry bushes when they’re in bloom, you might notice a bush of similar size and shape but with a different type of white flower – an open, five-petaled flower. What is it? It’s probably a black chokeberry (Aronia melanocarpa), which produces dark blue-black berries that are easy to confuse with blueberries – except that they don’t taste sweet and may seem a little woody. Blueberry plants can be valuable food to wildlife in different seasons. The berries don’t last into the winter, but rabbits and deer eat the twigs. Once the leaves are out on blueberry plants, several kinds of moth and butterfly caterpillars feed on them, including some caterpillars of the little blue spring azure butterfly (Celastrina ladon lucia). And we can’t forget the berries. Blueberries were an important food for Native Americans, who used them both fresh and dried. They made pemmican, a staple food that was easy to store and carry, by pounding together dried blueberries (or other dried wild berries such as cranberries and juneberries), strips of dried meat such as venison, nuts, and fat. Native Americans also originated the practice, still used by some blueberry farmers, of burning blueberry patches every few years to renew them. Humans aren’t the only creatures who relish wild blueberries. Mice, chipmunks, foxes, raccoons, and skunks feast on them, and so do black bears. Blueberries ripen in mid-July, after most birds that nest in our area have finished feeding their young with insects, so the berries are a good mid-summer carbohydrate source for many songbirds. If you go out picking wild blueberries, expect competition from local robins, catbirds, tufted titmice, brown thrashers, veeries, scarlet tanagers, and eastern towhees. Each berry contains more than a hundred seeds, although they’re so small that we rarely notice them. The seeds usually pass unharmed through the digestive tracts of mammals and birds, so these animals spread blueberry seeds. Besides growing from seed, wild blueberry plants also spread by underground runners, which produce new roots and stems. These new plants are genetically identical to the original plant and generally produce berries with similar qualities. If you find that wild berries from the plants in one patch taste better than the berries from another patch, genetic differences may be one reason. Much has been said in recent years about blueberries as a health food. They contain vitamins C, E, and a precursor to vitamin A. They’re touted for containing powerful anti-oxidants that can help prevent heart disease, stroke, and age-related mental decline. They contain resveratrol, a substance also found in red grape skins and red wine, which may help in cancer prevention. Blueberries also contain other substances that may help night vision and combat varicose veins and hemorrhoids. A substance that gives the berries their blue color may help to lower blood sugar levels. The berries may help prevent urinary tract infections and have been approved in Germany to treat diarrhea. Native Americans made tea from blueberry leaves to treat colic, labor pains, and to aid recovery after miscarriage. They also breathed in the fumes from burning the dried flowers to treat madness. Mashed blueberries have also been used as a purple dye, although it is not color-fast. Are you thinking of removing an invasive burning bush, also known as winged euonymus (Euonymus alatus), from your yard? If so, consider replacing it with a blueberry bush, which is recommended as a native plant alternative to burning bush. Not only do blueberry plants have lovely spring blossoms, tasty and nutritious fruit that attracts songbirds and other wildlife, but the leaves also turn red – either fiery red or mellow burgundy – in the fall. In winter their twigs are two-toned, with red on top and green underneath. And blueberry plants are well suited to the acidic soil of eastern Massachusetts. When you see blueberry blossoms or berries in the woods, in your yard, or in your imagination when you’re far from home, think of this native plant’s many relationships in the natural world, and enjoy being a New Englander.